As roofs get older and more exposed to the elements they can become susceptible to a number of different issues. Here are four of the most common problems that can occur. If you are not sure about the cause or don’t feel confident carrying out any repairs yourself it’s best to contact a professional roofing company, such as DPR. It’s important to keep an eye on your gutters to make sure they are not blocked or leaking, otherwise water could seep into your house. Make sure you check your guttering for debris such as twigs and leaves on a regular basis. If you discover holes in the gutter itself they need to be filled with sealant or covered using a patch. Something that should also be checked regularly are shingles. 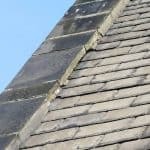 If you have missing or damaged shingles on your roof then the building will be extremely vulnerable to the elements which can easily lead to rot. It’s important to replace shingles you notice are broken quickly to prevent water getting in. It’s a good idea to inspect the eaves of your roof too in order to make sure there are no holes, cracks or rot as these make it easy for water to enter and need to be sealed if present. The roof trim, or fascia, should protect the edge of the roof from the weather, particularly water. A common issue with this part of the roof is rot which needs to be addressed quickly to prevent further damage. DPR Roofing is a leading provider of domestic and commercial roofing services across the Yorkshire area. Our experienced team of engineers can carry out roof repairs, maintenance, replacements and surveys as well as chimney and leadwork. For more information or to arrange a quote please get in touch today on 01924 640019.